Hi loves! How are you today? I am writing this post far in advance so I can't really tell you how I am ;-). Today I am showing you a fun skittlette that was created to feature Shimmer Sarah. 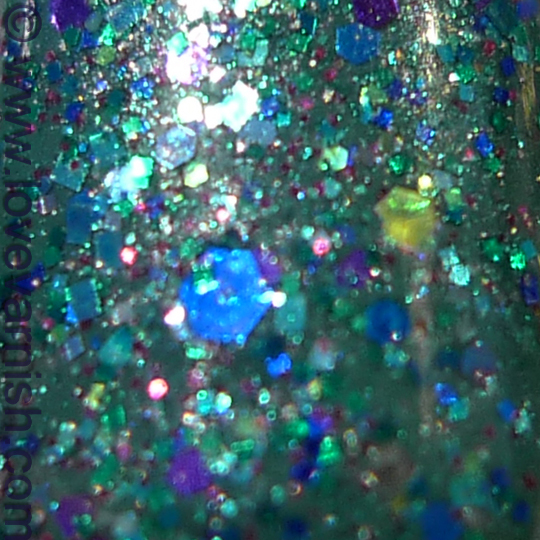 This won't be the only time I show this because this is just 1 nail, but as Loqi already said last Monday, we don't want to do the "regular" reviews because there already are so many of those out there about Shimmer polishes! Now, for this skittlette. Thumb - Bondi Lady Liberty (2 coats), 2 golden round studs. Index - Bondi Lady Liberty (2 coats), freehand leopard with China Glaze Exotic Encounters & Wet 'n Wild Black Crème. Middle - Bondi Lady Liberty (2 coats), gradient with China Glaze Exotic Encounters. Ring - China Glaze Exotic Encounters (2 coats), Shimmer Sarah (2 coats). Pinky - China Glaze Exotic Encounters (2 coats), 2 golden round studs. Shimmer Sarah is a gorgeous glitter, there is purple, blue, green and gold (I am not describing every glitter bit as it is near impossible to identify them all - these polishes are complex!) in a slightly muted sheer grey base. Therefore it is best to layer over darker colors, a lighter polish will be altered by the base. It applied so easy, spreading like a cream instead of a glitter. It also dries really smooth! I loved this manicure a lot! The combo of the glitter and the studs ♥ I love studs so much haha! Shimmer polishes can be bought in her Etsy webshop, a bottle holds 15ml. of polish and costs $12. Shimmer can also be found on Facebook and Cindy has a blog too! It looks fantastic! Love the whole combo! That is so fun and cute! Aww thanks dear! You created the beauty!